A friend enlisted my help in finishing her breakfast once. She prepared a simple, experimental dish of tuna cooked in coconut milk and some spices and dumped it all on some brown rice. It was spicy, hearty and very flavorful. I liked it so much that I begged her to tell me how to cook it. Fortunately for me, she was generous enough to share how it was done. You could just imagine how quick I was to try it out. Luckily, it tasted good enough—hot and spicy, with a heady hint of cumin. Mixed with the rice, it was simply enchanting. The rice was perfect for alleviating the spiciness, making you keep going and going until the last bite was gone. 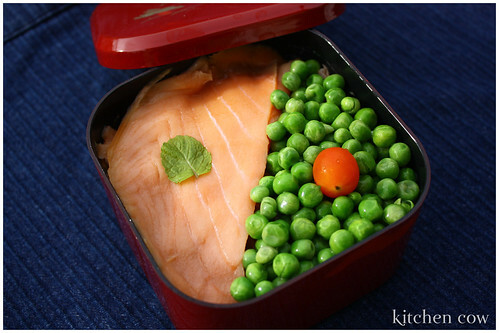 To go with the curried tuna rice, I topped it with some green peas and smoked salmon and a mint leaf and a cherry tomato to accentuate the design, making a colorful, fun and very hearty lunch. 1. Saute onion in oil, then season with half of the cumin and curry powder. 2. Add chili, then sautÃ© a bit. Add tuna and sautÃ© a bit more. 3. Add coconut milk then season with remaining cumin, curry powder and pepper. Add more coconut milk, depending on how liquidy you want it to be. 4. Spoon over cooked brown rice and mix evenly. 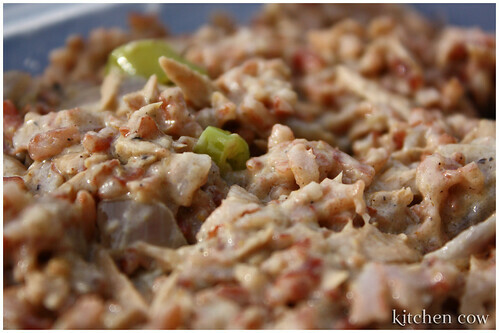 This entry was posted in bento, recipes and tagged bento, coconut milk, cumin, curry, rice, tuna. Bookmark the permalink. Aw wow that looks so good! I love love love spicy tuna, and you topped it off with salmon too. That meal’s so perfect! The salmon/green pea visual is sooo striking and tempting. Galing! My mom gave me some smoked salmon the other day, I’m going to have to experiment now! I might just try that curried tuna, it looks divine! hi. i stumbled on your blog while looking for bentos in Manila. 😀 I’ve been reading some of your posts and you named places in the makati area that sell bento boxes. do you know of any in the mandaluyong/quezon city area? i don’t go to makati often but i wanted to get a bento box for my coming trips in october. Hi Alexis! Glad you found your way here. A standard tip for me is to check out your nearby Japan Home / Daiso 88 stores, as well as any My Dollar Store branches in your area. The stocks are seasonal but if you go every few weeks or so, I’m sure you’ll chance upon some. SM Department store is also a good place to look, who’d have thought! They’re sure to have Thermos thermal bentos but I have chanced upon ordinary, Japanese-style boxes there too. Good luck searching! How does the stock there compare to Japan Home? Cause the Daiso at Alabang Town looks like the same as Japan Home. Do you think the one at St. Francis Square is part of the international chain or is it just Japan Home renamed? I fear going to the actual Daiso in Japan. Just the one in Singapore made my head spin—what more the actual Japanese one? Pingback: ?????? ???? | ??? ?, ???? ?, ??? ?